Also known as Chaliponga. One of the most important principle admixtures of Ayahuasca or Yagé said "to heighten and lengthen" the drinks inebriation. Direct import from Peru. 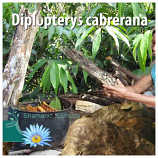 (28 grams dried leaves) In the westernmost Colombian Amazonia the leaves are often used as additives in the preparation of Ayahuasca Banisteriopsis caapi. The Sionas use this species to 'enhance the visions' to 'bring them into focus and bring about longer duration'. The term 'Oco' in all Tukanoan languages means 'water'. This plant was formerly known as Banisteriopsis rusbyana.